The 4-Pin Velobind Debinder tool is designed for use along with the Velobind V50 personal Velobinder, the Velobind V100 Electric Punch or the Velobind V110e Electric Punch. This convenient tool is used to help knock down the pins when using four pin reclosable Velobind binding strips. It can also be used along with six-pin reclosable binding strips. The four-pin Velobind debinder is designed to help in both binding and debinding your four-pin Velobound documents. While one side of the tool is dedicated to knocking down the reclosable pins, the other side of the tool includes a specialized debinding pin that can be used to unsnap the pins from the Velobind receiving strip. Normally these tools are only available when you purchase a Velobind V110e Velobind binding machine. However, if you need an extra tool or if you lose or break your tool, Mybinding.com is one of the only places you can get these replacement tools. Please Note, however, that these tools are not designed for binding or debinding 11-pin hot knife Velobind strips. In order to debind hot knife Velobind Strips or Surebind strips, you will need the Velobind / Surebind Hotknife debinder tool that actually cuts the pins that bind your books together. I haven't used this yet, but based on the video, it looks super easy to use. Welcome to MyBinding video. 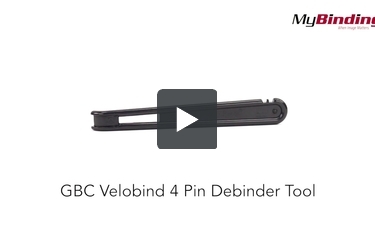 Here we have the GBC VeloBind 4 Pin Debinder Tool. This convenient tool is used when binding with GBC's 4 Pin reclosable VeloBind binding strips but between you and me, it works with the 6 Pin design too. The great thing about this tool is that it both binds and debinds your books. This example binding has been used many times. To close the binding, take the binding side of the tool and push the pins into their slots. You may find that you have to go over it more than once. Use the debinding side of tool to snag the pins and pull them out. This part is a little more tricky and you may find yourself trying it a couple of times per pin. And that is the VeloBind 4 Pin or 6 Pin debinder tool. For more demos, reviews and how-to's, go to MyBinding.com. The GBC four pin bind and debind tool is designed for use with GBC’s four pin reclosable binding spines. It is a small hard plastic tool and includes features to help you bind and unbind your documents with four pin Velobind. Normally you will get one of these tools when you purchase a personal Velobind punch such as the V110e or V50. However users who have a larger hot knife binding system and want to bind documents with reclosable strips won’t have one of these tools. Additionally, these tools are fairly small and can become lost or broken. In these cases, a replacement tool can be purchased. 1. First you have to punch the holes in your document. You can use a small punch like the V110e or can use a larger machine that produces an eleven pin pattern (the four pin hole pattern will line up). You can even use pre-punched paper. 2. Next you need to insert the strip with the pins through the holes on your document. 3. Then you need to insert the receiving strip onto the back of your document making sure that the pins extend through the holes in the strip. 4. Finally you need to snap the pins into the channels on the back of the receiving strip. The four pin debinder tool is really meant to help users with the fourth step. The smaller end of the tool has a rounded bullnose style edge. This part of the tool has an indent so that it will slide smoothly along the receiving strip during the binding process. In order to use this tool you simply place it on the receiving strip and quickly push the tool forward bending the excess pin over and snapping it into place. You will need to do this with each of the four pins. The other side of the tool is designed to help you edit your documents that are bound with four pin reclosable binding strips. It has a small nook near the end of the tool and inside that nook there is a little knob. The nook is designed to be the same width as the binding strips and the knob is designed to grab onto the pin from your Velobind strip so that you can lift it up in order to debind your document. Trying to unsnap the pins from the receiving strip without this tool can be somewhat difficult. The Velobind four pin bind and debind tool is pretty easy to use and it can definitely help in assembling and editing your documents. However, it is only made out of plastic. Although it would be difficult to break the tool as a whole it is possible to break off the small debinding knob if you are not careful. Unfortunately, the tool is pretty much useless without the debinding knob. That just means that you need to be careful when you are lifting the pins from the receiving strip that you don’t pry too hard. The binding and debinding process is still fairly manual even when using this tool. Unfortunately, that is the nature of four pin Velobinding. The tool will help to save you time over trying to bend the pins over by hand. It will also provide a tighter bind. However, you still need to deal with each pin individually and it can take quite a bit of time. For organizations that are binding documents with reclosable four pin Velobind binding strips this tool is almost a necessity. Although it is possible to bind your documents by hand, the four pin bind and debinder tool will help increase productivity and make the binding process a lot easier. Just be careful with the debinding knob and you should be set to go.